I am not the least bit ashamed to admit that I am soooooooooo geeked for this. Back in the day, I was a rabid fan of Zorro -- even to the point of dressing up like the dude himself, and brandishing a chalk-tipped plastic sword, for my 6th birthday party. (My mom, God rest her soul, got me this item as a Christmas present.) Guy Williams -- a.k.a., Don Diego de la Vega, a.k.a. Zorro -- was my childhood hero (a status he solidified when he followed up this classic series with Lost in Space). And the show itself -- broadcast in living black-and-white on ABC -- invariably was the highlight of my week. Hell, I even remained in my seat for the commercial breaks, especially when the chicken named Fresh-Up Freddie popped up to hawk 7-Up. 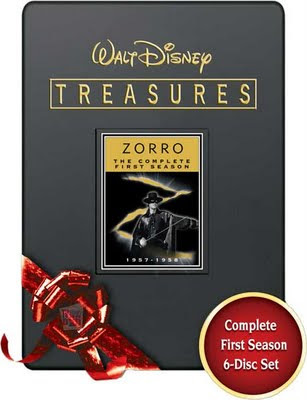 Zorro lasted only two seasons, followed by four hour-long "specials" that aired as part of Disneyland. But your have to remember: During during the 1957-59 era, it was common for a show to air as many as 39 new episodes each season. Which means that -- oh, be still my beating heart! -- between the two boxed-sets of DVDs that hit the streets next week, complete with commentary by Leonard Maltin, I have 78 freakin' half-hour segments to sample during my sentimental journey down memory lane. Cowabunga. Come on, everybody, sing it with me: "Out of the night, when the full moon is bright, comes a horseman known as Zorro..."
Believe it or not, I had the exact same costume, complete with the chalk-tipped sword (though the chalk snapped off very early on). It was my favorite costume ever (as a kid, that is). And like you, I've been waiting for this DVD set forever (at least twice a year I'd asked Leonard, "Any news on the "Zorro" rights? ").